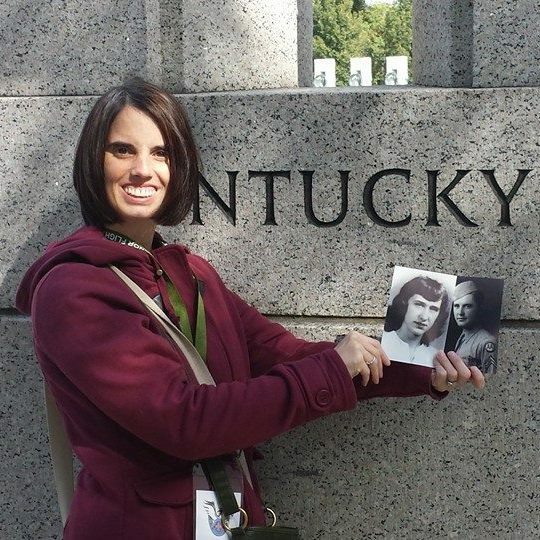 Leslie McCarty at the WWII memorial in Owensboro holding photos of her husband’s grandparents. Get to know your KATH Board Members! Here’s a spotlight post on Leslie McCarty, the Librarian/Archivist Representative. She is the Kentucky Room Manager at the Daviess County Public Library in Owensboro, KY.
Current School and alma/mater: I received my Masters in Library Science from Texas Woman’s University in 2008. I graduated from Western Kentucky University in 2002 with a Bachelors of Arts. I majored in History and minored in broadcasting. Fields of Interest: American History–World War II, Civil War, early 20th Century, Jewish History, Kentucky history, genealogy. When did you first develop an interest in history? I became very interested in genealogy and local history when I was a teenager. I always wondered how my family came to Hardin County, KY and was curious about the cultural context in which my ancestors lived. Learning that I was at least a 6th generation Kentuckian, this because a source of pride and I developed a love of Kentucky and local history. The concepts and events behind historical events always came easy for me to understand, and it helped me to appreciate other cultures and to have a deeper understanding of the why in our daily lives. This was extremely fascinating to me when I took Kentucky history and American History classes in college. In 2000 I was commissioned by the Fort Duffield Heritage Committee to interview West Point town historian Richard Briggs about life in the 20th century in West Point. These interviews culminated into a book called Driftwood on the River: Life and Times of West Point in the 20th Century. How have your interests changed since graduate school? Because of my connection with the Kentucky Room, and I have done many presentations in the community focused Owensboro history. Working as Kentucky Room Manager has given me the opportunity to use the library’s video and audio equipment to do oral histories with WWII and Korean War veterans. I have also filmed many local events and have been able to do behind the scenes documentaries about them. I am still interested in the context behind an event, but it is more personal because I have heard so many oral histories. Also, part of my job is adult program coordinator. I have hosted many speakers from different walks of life. Two of my favorite speakers have been Holocaust survivors. Their stories have had a major impact on me, especially because these two speakers have become dear friends. Their connection to that part of history makes it tangible. What projects are you currently working on? I am working with a local committee to honor the 20-year anniversary of the clean-up of Greenwood Cemetery, which is a historic African-American Cemetery in Owensboro. We will have a small program and dedication of a marker, bench and tree in the cemetery to honor those who contributed to the clean-up. This will be my ninth year as lead researcher for Voices of Elmwood. Voices of Elmwood is a community presentation about the lives of those buried in Elmwood Cemetery. We research those buried in Elmwood, take the research and turn it into a five-minute monologue, and in September the public can pay to ride a hay wagon through the cemetery and “visit” 10 performers who tell the story as if they were that person. People are in period costumes. We have done 90 stories. This is partnership with the Owensboro Museum of Science and History and Theatre Workshop of Owensboro. Other than history, what are you passionate about? I am very passionate about honoring veterans. My dad served for two years in the Marine Corps, so I was around veterans growing up. I have become involved with Honor and Remember, who gives flags to the families of soldiers who were Killed in Action. For three years this organization has helped plan the Kentucky Remembers 5K race with Kentucky Gold Star Mothers. I recently became a board member of the Brandon Scott Mullins Foundation. Brandon was killed in Afghanistan in 2011. I have been a guardian for two Honor Flights. My other passion is television, professional wrestling and my two pugs, Murphy and Pumpkin. Any final thoughts? Get to know your community. So many people that you are not aware of had made amazing contributions either in their profession or in military service. Never forget those who came before you. They are the reason you have freedom.